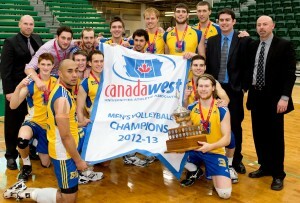 Brandon University (BU) men’s volleyball team has captured the Canada West championship – the team’s first since joining the conference in 2005. The Bobcats, ranked eighth nationally, downed third-ranked Trinity Western Spartans during weekend playoffs in Alberta. Head Coach Grant Wilson says the championship title is the culmination of a dedicated effort by players, coaches and program leaders. Bobcat Sam Tuivai showed why he’s one of the best in the nation with 22 kills on 44 swings, nine digs, four aces and four blocks. Rookie Roy Ching continued his impressive play with 15 kills and 15 digs. Fifth-year setter Garrett Popplestone recorded match-highs in both assists (44) and digs (16). The Bobcats will compete in the CIS national championships, beginning March 1st in Quebec City.